You are curenlty in Arkray Inc Techlite™ Lancet 25g, Sterile, Disposable made by Chronimed / Hypoguard and asigned to category. Techlite™ Lancets Are Sterile, Disposable, Devices Used To Obtain A Capillary Blood Sample. They Are Available In 25 Gauges, 28 Gauges And An Ast Lancet And Are Compatible With Most Standard Lancing Devices. The Lower Gauge Lancets Work Best On Callused Fingers Where It Is Sometimes Difficult To Obtain A Sample. The Higher Gauge Lancets Work Best For Individuals That Lance Their Finger Frequently Or Have A Thin Skin (such As Child Or Elderly Persons). Available In Most Popular Needle Gauge Formats. Smooth, Tri-Bevel Point Promotes Comfortable Sampling. Compatible With Most Finger Lancing Devices. Contoured Body For Easier Handling ( 25 And 28 Gauge Formats). 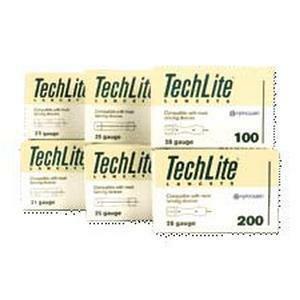 You have selected Arkray Inc Techlite™ Lancet 25g, Sterile, Disposable from Blood Glucose Monitoring Supplies. We hope that this Arkray Inc Techlite™ Lancet 25g, Sterile, Disposable made by Chronimed / Hypoguard is what you were looking for. If you have any questions about this particular Arkray Inc Techlite™ Lancet 25g, Sterile, Disposable or any other products from Blood Glucose Monitoring Supplies, please call us. We have an experienced staff that will gladly help pick out the correct Arkray Inc Techlite™ Lancet 25g, Sterile, Disposable for you, also. If you are looking to make a purchase of Arkray Inc Techlite™ Lancet 25g, Sterile, Disposable in large quantity or you are a Hospital or Medical facility and need help on making a purchase of Arkray Inc Techlite™ Lancet 25g, Sterile, Disposable made by Chronimed / Hypoguard, please contact us.